You can send invitations to people by clicking this icon on the Members page. To send an invitation just add the person's email address and click Invite. They will be sent an email and you will be taken to the members pending page. The person to whom you have sent the invitation will be able to join your school by clicking on a link in the email and either registering for a Read Listen Learn account or logging into their account if they already have one. When they have done this they will be shown a screen that enables them to either accept or decline your invitation. People can end you requests to join your school using your enrolment page. Here you'll find the address of your enrolment page. 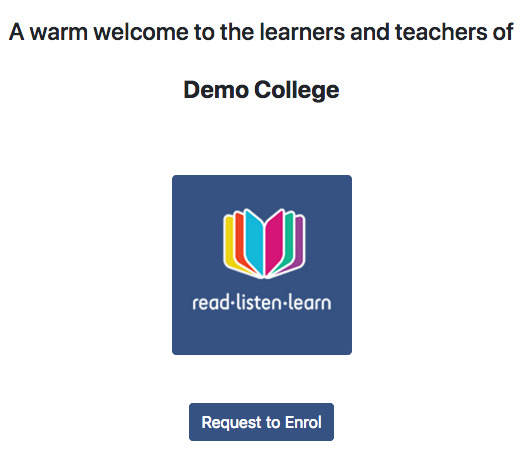 If people access this page and click Request to Enrol, they will be asked to either register for a Read Listen Learn account or log into their account. Once they have done that you will be sent an email letting you know that they have asked to join your school and their email address will display in the Requests section of the members pending page. You can then choose to either Accept or Decline their request.